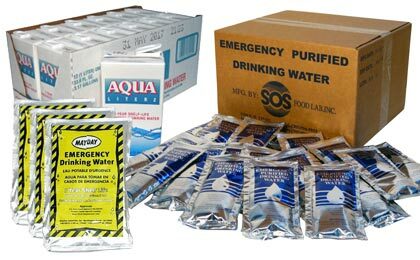 A Ready Supply of Drinking Water to Get You and Your Family Through the Worst Case Scenario! Emergency kits require a readily available water supply that takes up as little space as possible. Our pre-packaged drinking water pouches have a 5 year shelf life and are the perfect size for your emergency kits or for home storage as an supplement to your emergency water supplies. Enter Code WEST15 at checkout to apply discount. Offer is valid on case quantities of emergency water and cases of emergency food bars only.